Leeks are the last crop my neighbor Beppi harvests from his garden before the onset of winter. They are the slowest growing of all his vegetables as well–planted in early spring and not ready for harvest until late October/early November. 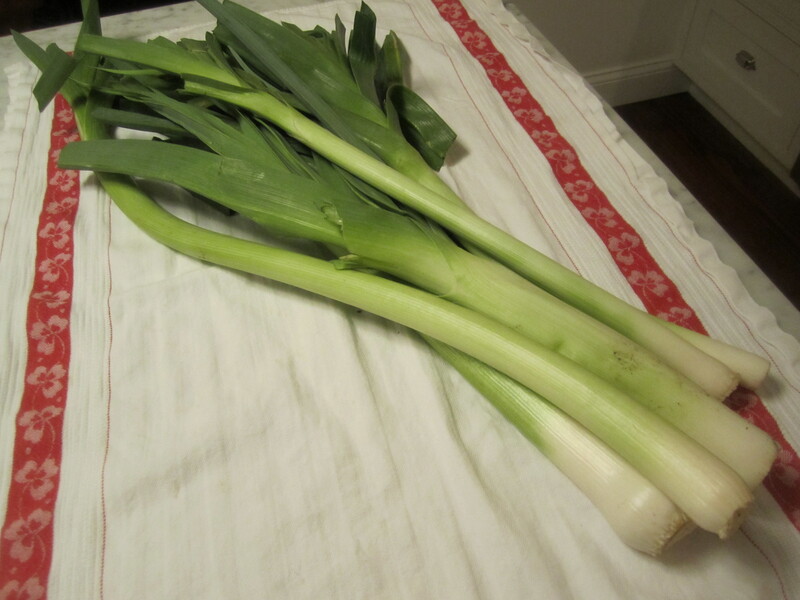 I’ve been waiting to receive these leeks so I could try my hand at making Beppi’s leek and potato soup. I watched him make it for his birthday dinner a couple of weeks ago and I’ve wanted to make it ever since. 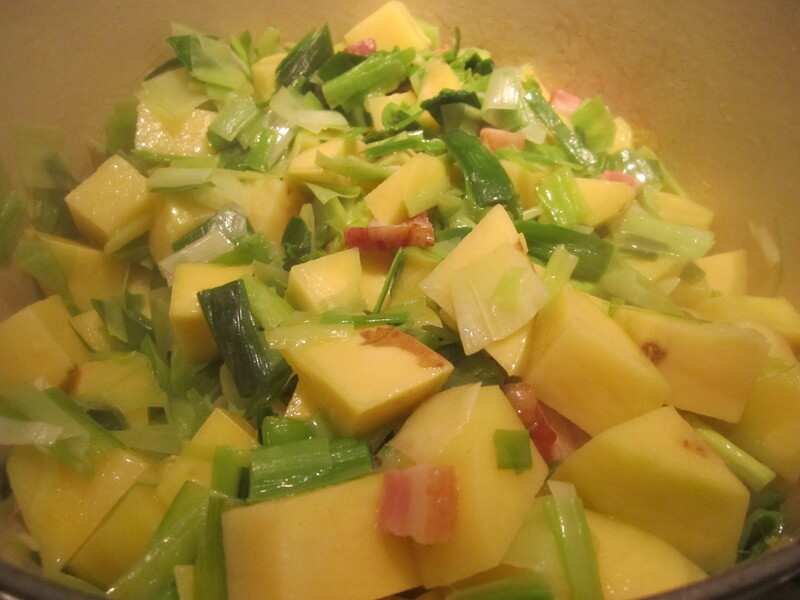 The technique and ingredients are simple–saute pancetta (I’m using bacon because I have it in the house, although Beppi would probably not approve), leeks and potatoes in butter. Add chicken broth and simmer for an hour. Cool and puree. The dish will depend on quality of your ingredients and your ability to season it properly with salt and pepper. 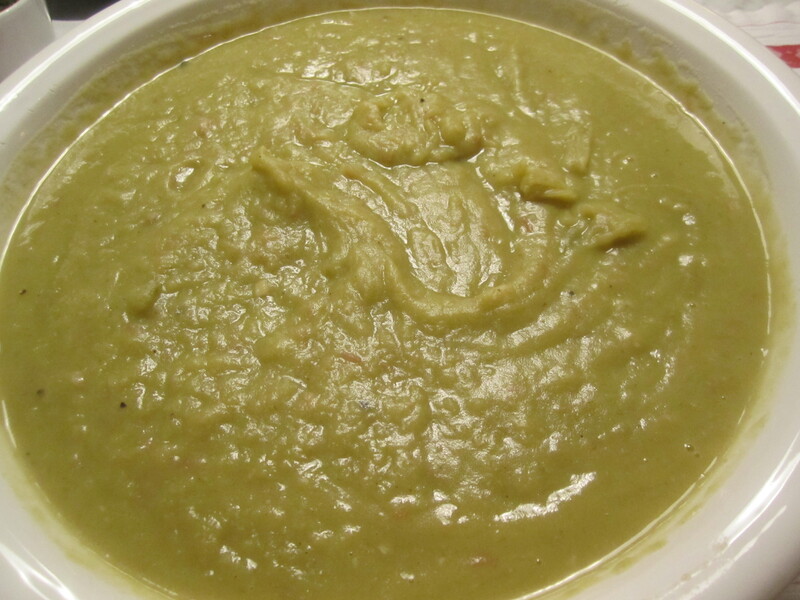 Often when someone makes soup for the first time, their complaint is that it tastes bland. This is usually due to under-salting. Add salt judiciously–hold back a little until the soup is almost finished cooking so as not to risk over-salting, but keep adding salt until it hits that high flavor mark that you’ll recognize once you’ve hit it. 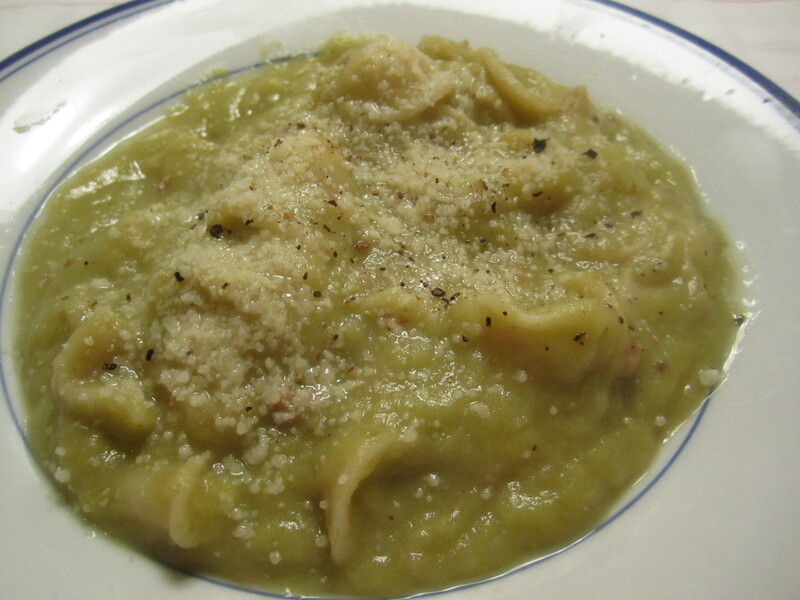 Beppi sometimes adds cooked orrechiette to the soup and uses the soup as a pasta sauce. I’ve decided to do that tonight, since it’s my main course. Makes a large batch–easily enough for 12 portions–more if you’re adding pasta to it. 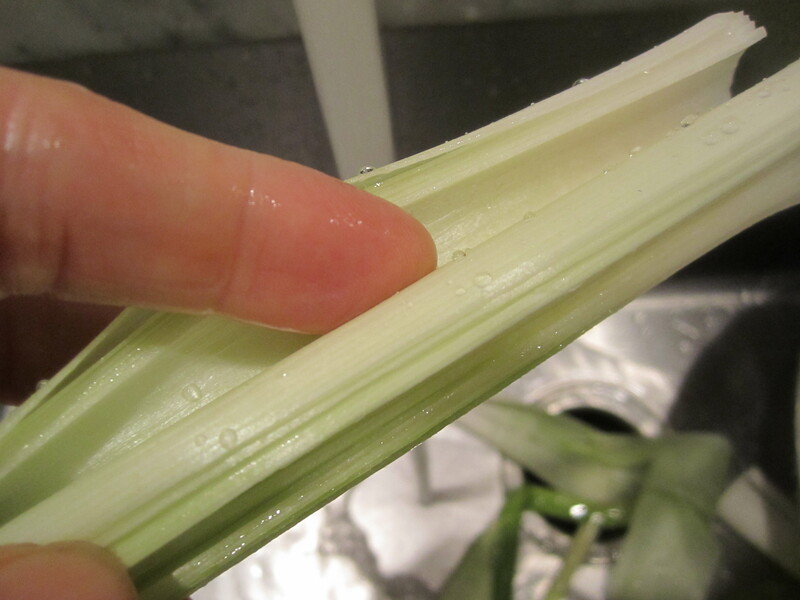 wash leeks by removing the root as well as a 1/2 inch of the base, then splitting and separating the sections under running water, until all visible dirt has been removed. 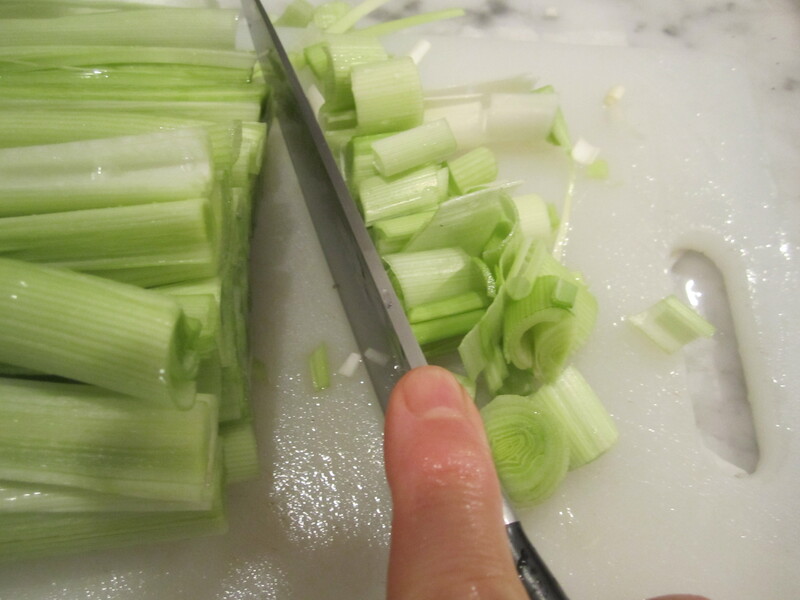 Slice crosswise the entire leeks, greens and all. Wash, peel and dice potatoes into 1″ cubes. 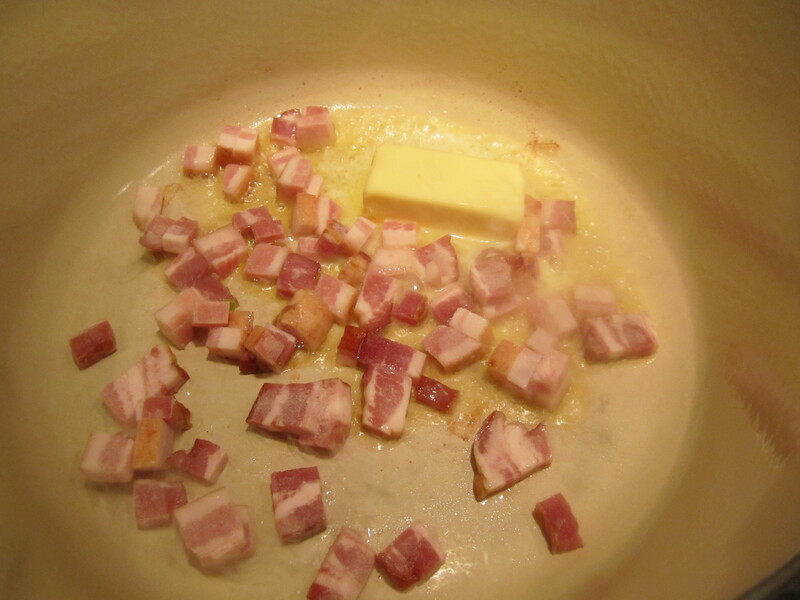 In a heavy-bottomed dutch oven on low heat, render bacon in butter for about 3 minutes. 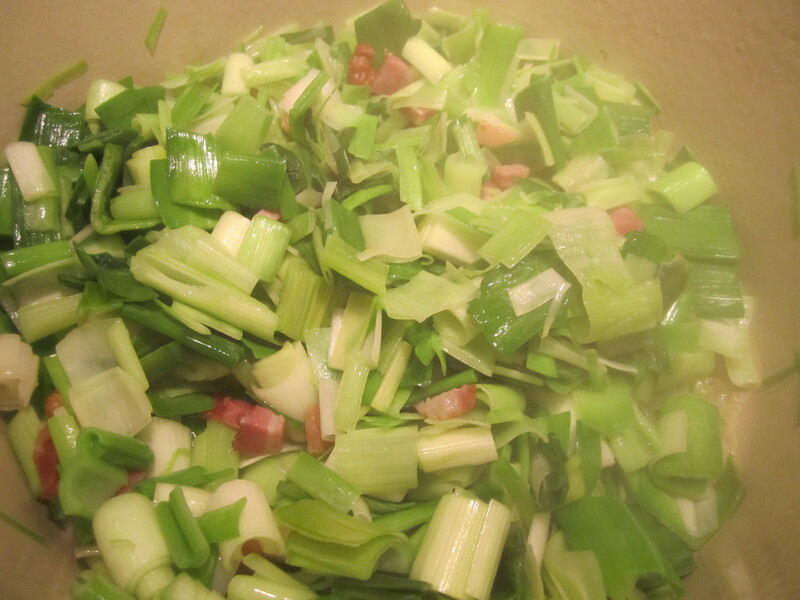 Turn heat to high and add leeks and saute until leeks have reduced slightly in volume–about 5 minutes. Add potatoes and continue sauteing for another 5 minutes. Add broth and simmer, partially covered for 1 hour. 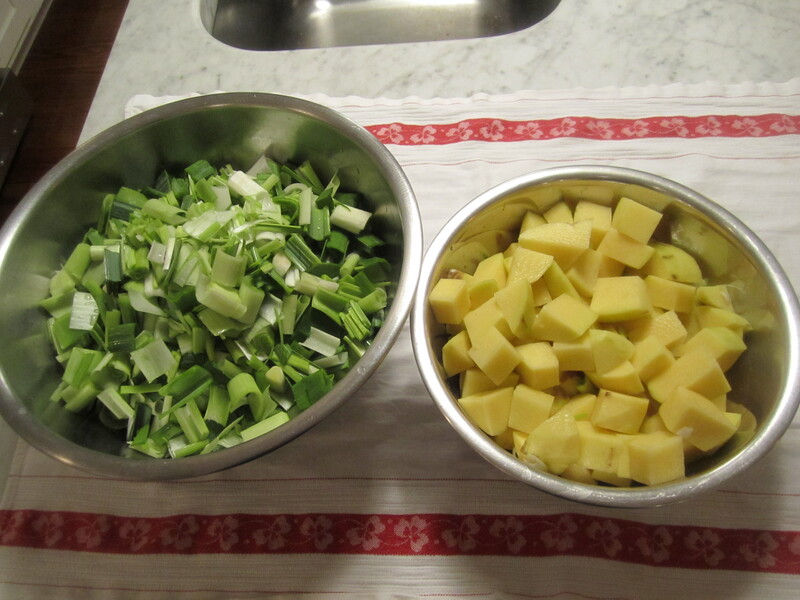 After 1 hour, the potatoes and leeks will be very tender. Taste and add salt and pepper–Beppi adds an aggressive amount of pepper (at least a teaspoon). Allow to cool slightly about a half-hour is sufficient), then process to a smooth puree in the food processor, working in batches. Be careful not to overload the processor, since warm liquid tends to combust a bit, leaving your countertop (and you) covered in thick, molten soup. Freezes well indefinitely. 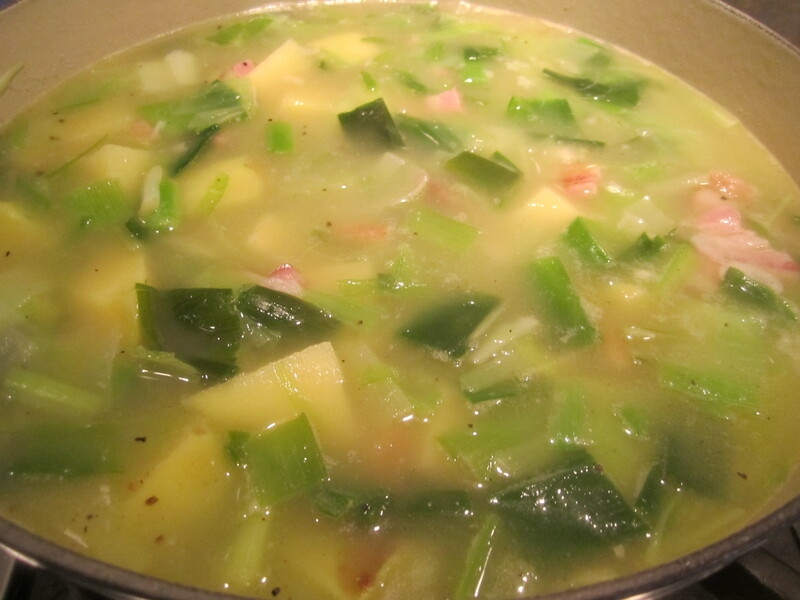 To reheat, add a bit of broth or salted water to thin the soup. If serving with pasta, simply boil pasta and add to soup at the last minute. Serve with plenty of grated parmigiano.